The mental health screening and treatment program announced by UCLA Chancellor Gene Block is part of the UCLA Depression Grand Challenge. 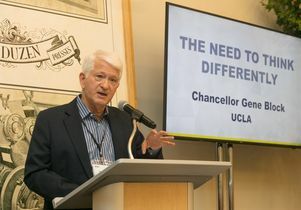 Speaking before dozens of influential business and civic leaders about mental health in the workplace, UCLA Chancellor Gene Block announced today the university will for the first time offer free mental health screening and, if appropriate, treatment, to all incoming freshmen and transfer students. “It affects about 350 million people worldwide, and yet, in my view, depression remains somewhat overlooked and understudied. That depression has not been identified as our number one health issue astounds me,” said Block during his keynote speech at the inaugural One Mind Initiative at Work summit. The One Mind Initiative was founded by Garen and Shari Staglin as a part of the One Mind Institute, a public nonprofit dedicated to raising awareness, funding research and finding solutions for brain illnesses. The free mental health screenings, which will eventually be made available to the entire UCLA community, are just one part of the UCLA Depression Grand Challenge, a campuswide effort to reduce the health and economic impacts of depression by half globally by the year 2050. The online screening and treatment program is thought to be the first-ever campuswide mental health screening program conducted at a university. “Depression has no regard for demographics,” Block told the audience in a hotel conference room in St. Helena, California in Napa Valley. Garen Staglin said that UCLA’s efforts may serve as a model for how other businesses and institutions tackle the issue of mental health in the workplace. The announcement signals a new phase in the Depression Grand Challenge, which has brought together more than 100 researchers from more than 25 academic departments — and growing — to develop better methods of detecting, evaluating and treating depression. Researchers also aim to eliminate the stigma associated with depression, which is often a barrier to seeking diagnosis and treatment. 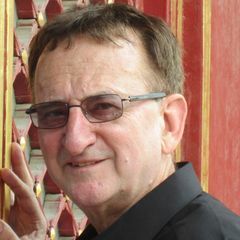 The Depression Grand Challenge is being led by Dr. Nelson Freimer, director of the Center for Neurobehavioral Genetics and professor of psychiatry at UCLA and associate director for research programs of the Semel Institute for Neuroscience and Human Behavior. It was announced in 2015, in line with President Barack Obama’s earlier call to companies, universities and other organizations to work innovatively to solve important national and global problems. Its initial phase involved the voluntary screening of more than 1,000 people at UCLA, the treatment of nearly 300 patients and a series of demonstration projects to begin the process of understanding the causes of depression and how depression affects the brain and body. As part of this next phase, nearly 10,000 incoming freshmen and transfer students will receive the first invitations to join the effort in the next few weeks. The voluntary screening will then be opened up to the campus community, including the health system, with the goal of incorporating 100,000 people in the research study, making it the largest and most comprehensive depression study ever undertaken. The results will help inform research on depression and mental health and those who are found to be at risk for depression or who have depression will be offered a free, eight-week cognitive behavioral treatment program with the option of receiving additional support based on the severity of their symptoms. These include peer-led groups and clinical assistance from the Depression Grand Challenge Innovative Treatment Network. Treatment will also include state-of-the art monitoring of daily functions, such as activity levels and sleep, to help identify early warning signs and direct immediate treatment, avoiding the lapses that often occur between a patient’s immediate needs and their ability to meet a counselor. Students will continue to have access to mental health resources through UCLA Counseling and Psychological Services. CAPS provides 24/7 crisis counseling, emergency intervention, individual and group counseling and other related services. Block said that the university’s work so far has showed promise and that it’s hard not to feel a “surge of hope” given the campus’s response so far to the Depression Grand Challenge. 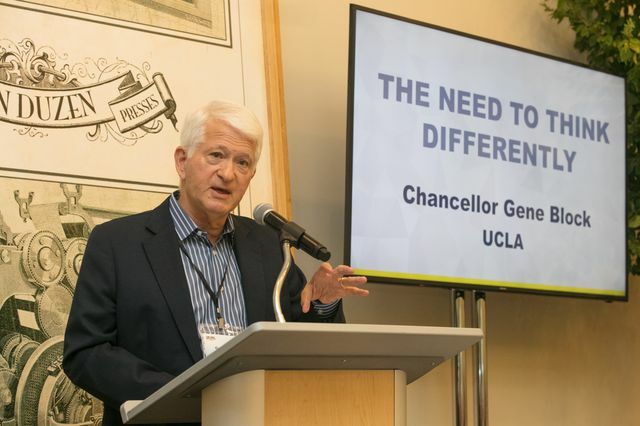 UCLA Chancellor Gene Block speaking at the One Mind Initiative at Work summit on Sept. 14.